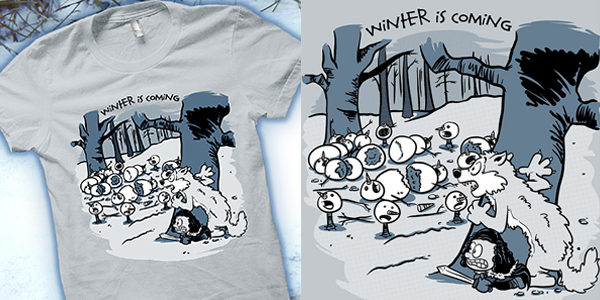 Winter Is Coming T-Shirts Are In The Store! I worked SO HARD on this design, you guys. I had to take the full color/water color effect I used in the original comic and distill it down to three colors. Not as easy task, but I am VERY pleased with the result. This is definitely one of the best shirts I’ve ever made. Please show your support for HE by picking one up in the store, or forwarding a link to your friends that might be into Game Of Thrones, Calvin and Hobbes or, god forbid, both. Tweet it in the Facebook with your G+ or whatever Internet type situation you have. Let’s get the word out! Posted in Comic Blog and tagged store, t-shirts. Love the shirt! Can't wait til I get paid so I can buy one. 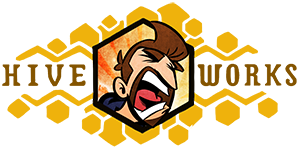 Idea: hoodie perhaps? Don't know if that's feasible/possible or whatever, but it would be neat. Done and done. Best mashup of two favorite works. Nicely done. Love it. Bought it. How long will it be in Pre-order purgatory? Will I at least receive it by (Winter religious holiday of your choosing)? They definitely wont ship until after we get back from NYCC. I'll post an update then. Shirt arrived today!!! It is glorious and medium and fits me. Dear All FBs: BUY THIS NOW! Support an artist while indulging your geek cravings! Will there be a ladies version? If these sell well, I hope so. Love the shirt and I want to order it, but it looks like medium is out of stock. Any chance there will be more before the holidays? i believe they are being reprinted right now. Nope. The light grey shirt is one of the primary colors of the design. Putting it on a darker shirt would require a complete redesign.